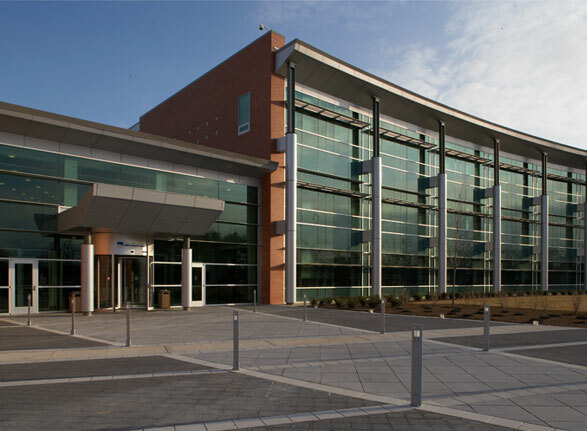 The Edward L. Kelly Leadership Center is the main administrative office facility for Prince William County Public Schools. The project consisted of development of a 20 acre site which included new storm, water and sanitary systems. Also included were new parking areas, irrigated lawns, on site storm water retention facility and a sanitary sewer pump station. The building is a 3 story, 145,000sf steel structure with a facade consisting of brick veneer, aluminum curtain wall and composite panels. The facility serves as the Administrative Headquarters for the school system and therefore includes multiple office spaces, conference rooms, classrooms and miscellaneous meeting rooms. A full service commercial kitchen, exercise room and the main school board meeting room are also contained within the building.